Did you know your dog could have food allergies or sensitivities? Yes, it is true. Just like human counterparts, these pets can have allergic reactions to certain foods. The dog’s body does not recognize the ingredients as food. Instead it sees the ingredients as a foreign enemy, something to be attacked instead of processed. So if your dog gets itchy dry skin, is nauseated, or vomits because of certain ingredients in their diet, it is time to find a hypoallergenic dog food. There is a slight difference between a food allergy and a food intolerance. A food allergy is when a dog’s immune system sometimes incorrectly identifies an ingredient as dangerous. In this case it then forms self-protective antibodies to attack and fight it. On the other hand, a food intolerance is not an immune reaction. Rather, it is a digestive problem when the ingredient simply cannot be processed. To find out if your dog has an allergy or an intolerance you should check with your veterinarian. They will run some tests and identify exactly what your dog has a reaction to. Some of the most common allergens include beef, dairy, chicken, lamb, fish, corn, wheat, soy and yeast. All or none of these could be the root cause of discomfort for your pet. Different dogs will be allergic to different foods. That is why there is no such thing as a hypoallergenic or non-allergic pet food for every dog on the planet. Despite what may be the most popular hypoallergenic dog food, you need to find a solution that suits your dog’s unique needs. The idea behind finding the best hypoallergenic food for your dog is limiting the number of ingredients. In doing so you can quickly narrow down what is causing problems for your beloved pet. That way, if your dog has an allergy to a common food ingredient like chicken or corn, then you can find a different dog food with novel ingredients. Start with foods that have a single source of protein and work from there. As you take these steps to fulfill your dog’s needs and provide them with a healthier diet their overall health and happiness will improve. A lot of illness in dogs can directly be connected to what they eat. A healthy diet means a healthy pet. For the past 20 years Newman’s Own Organics has been formulating a great tasting product both you and your pet can feel good about. These holistic formulas are all based on the newest concepts of animal and nutrition. That is why the Newman’s products are all made in the USA and 70 percent of the top-quality ingredients are organic. All ingredients in these products are produced without the use of herbicides, pesticides or artificial fertilizers. Each formula contains a unique blend of proteins, whole grains, vitamins and minerals. There are also no preservatives or chemical additives. No wheat or corn fillers, no artificial flavors or colors. Basically, this pet food is only full of the good stuff. The hypoallergenic dog food is suitable for all life stages of your pet. Consumers say this is a golden standard of dog food. Their pets love it and it looks and smells like real food. They also say it is by far the best hypoallergenic dog food on the market and exceeded their expectations. It may not be apparent that Holistic Radiant dog food is part of a hypoallergenic diet. This is especially the case if you skim the ingredients. However, what this dog food does is improve and heal your dog’s digestive tract. Though it does use grain as a leading ingredient, it is whole grain, full of essential fibers and nutrients. Other novel ingredients introduce whole and natural foods into your dog’s diet. The dry dog food includes prebiotics, probiotics, herbs, botanicals and digestive enzymes. It will help clear away waste in your pet’s system and improve some of the leading allergic symptoms. The Holistic proteins include chicken, duck, lamb and seafood. These single source meat proteins make it ideal for dogs with allergies or digestive issues. Your dog also needs a nutritious and well balanced diet, something this healthy dry dog food will provide. The recipes for all Holistic Select dog foods are complete and balanced, fortified with vitamins and minerals. It is designed to support all life stages of your pet and meet their special needs. If your dog shows signs of sensitive skin or sensitive stomach, then this dry dog food has been specifically formulated for their needs. It helps to support a healthy lifestyle for your pet. It can provide complete, every day nutrition. Is fish your dog’s favorite novel ingredient? Great! The novel protein in this dry dog food is salmon, listed as the leading ingredient. The easily digestible carbohydrates include oatmeal and rice. The crunchy kibble formula is easy to chew, easy to digest and is a top quality source of healthy fatty acids. Your dog’s skin and coat will be enriched and their stomach sensitivities will be minimized. 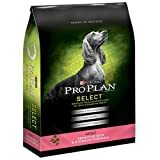 Consumers who love Purina Pro Plan say it is an affordable, hypoallergenic option for their pets. From young to old and across all breeds, the pet food has proven to be a viable solution, even for finicky eaters. If you are not up for a vet prescribed dog food, then this hypoallergenic diet can help save the day. If you are looking for a limited ingredient diet that does not compromise the balanced nutrition for your pet, then this is the hypoallergenic dog food for you. This dog food does not use any grains like wheat, barley, corn or rice. Instead, the enhanced formula contains venison. It is a premium quality protein source listed as the number one ingredient. It is not commonly used in pet foods and is a novel protein to help pets with food sensitivities or allergies. Next up in the ingredient list is sweet potatoes, a top quality carbohydrate that is rich in potassium. It is an easily digestible energy source that will benefit all life stages and all breeds of dog. Give your canine something nutritionally balanced when meal time rolls around. Consumers say this product provides an excellent allergy response, many seeing improvement in their pets within just two weeks. If you are a skeptic about hypoallergenic dog food, then Natural Balance can make a believer out of you. Health and happiness are things you want for yourself and for your canine companion. You need to be giving your pet superior nutrition, despite their allergies or intolerances. Your dog has a carnivore’s ancestral diet, which is why the closer you can get to that natural diet the happier and healthier your pet will be. With Nutrience Grain Free dog food you get all the same nutritious qualities of the Nutrience brand, just without the grains. All protein ingredients are combined with healthy fats, fruits, botanicals and vegetables. Unhealthy and common allergens like corn and wheat are replaced with low-glycemic lentils and sweet potatoes. If your pet has a food allergy or sensitivity, then this is an excellent source of nutrition. This is especially the case for pets with a highly active lifestyle that need carbs to burn. Every bag of Nutrience dry dog food represents unwavering attention to quality and a “no bad anything” promise backed by the company. Consumers say Nutrience does hypoallergenic dog food right. The dogs love to eat it and the owners love the nutrition it provides for their pets.When looking for a hypoallergenic dog food for your canine companion, nothing conveys that love like The Honest Kitchen. This gluten-free dog food is made with line-caught white fish and natural produce. It is high in protein, low in natural fats, and is perfect for all life stages and all breeds of dog. It is especially good for pets that need a gluten-free, low carbohydrate diet. There are also no by-products, fillers, or preservatives. The food is finely diced and easy on the digestion. It is made in a human food facility with 100 percent human-grade ingredients. Each part of the recipe comes from a company owned farm into your pet’s bowl. Consumers stand behind this product, saying it is a great treatment for allergies and stopped their pet from getting the itches and scratches. It is superior quality and their pets have loved it. It is perfectly suited for pets that need to avoid poultry, flax, and white potatoes. This is an all natural alternative to other therapeutic diets. If your dog has food allergies or an intolerance, this is an effective diet to help ease those symptoms. Talk about limited ingredients, this dog food is made from only five main ingredients. You chose the novel protein of duck, lamb or, in this case, salmon. Beyond that, other healthy ingredients include canola oil, tomato pomace, vitamins, minerals, and ground rice. There are no meat by-products, no dairy, and no harmful fillers like corn, soy, or wheat. There are also no artificial colors, flavors or preservatives. With this limited ingredient diet you can keep nutrition simple and easily digestible. Consumers say this is a good food for a great price. Their pets are happier and healthier on the Wellness Simple diet. If you fear your dog is suffering from a food allergy, this is a great set of dry dog foods to try. The Brothers Complete brand provides advanced allergy care for your dog. Numerous skin conditions and allergy-related symptoms are alleviated with proper diet. This dog food is made with the perfect protein, turkey meal, with all 22 amino acids. Basically, the meat meal provides 300 percent more protein than a natural source. As a carnivore, your dog was designed to eat this animal sourced protein. The added Enzymes, prebiotics and probiotics help make this an exceptionally healthy and nutritious dog food. It heals and promotes excellent health from the inside out. Most pet foods today contain large amounts of grain or potatoes. These often prove to be problematic for dogs with food allergies. There are no allergy causing grains or potatoes in this dog food. Instead a low glycemic carbohydrate called cassava or tapioca is used as a binder. These ingredients put Brothers Complete dog food closer to your dog’s historic diet. Consumers say that their pets with food sensitivities reacted well to the change in diet. Brother Complete worked when nothing else would help. All diets made by First Mate are made with high quality, all natural ingredients. This particular dog food has a single source of protein. 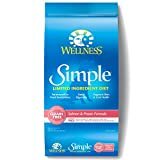 It is grain free and part of a simplistic diet meant to combat allergy symptoms. If your dog has allergies or digestion problems, then First Mate Chicken with Blueberries is an ideal recipe. Whole, fresh blueberries may seem like a strange ingredient in a dog food, but what they do is provide antioxidant benefits. It will help strengthen their immune system, improve the urinary tract, and increase eyesight and brain function. Also it is a great source of dietary fiber. Not only can this food solve digestion issues, it can also help prevent cancer. Consumers say this is a great product. It is palatable to dogs and provided a solution for pets with food sensitivities and allergies. It also cut back on tear stains and gave pets a shinier, healthier coat. Want to know a best-kept pet food secret? Well it comes from Australia in the form of Addiction Holistic Dry Dog Food. Talk about a novel protein. Kangaroo is probably not anything you have found in other commercialized pet foods. Fact is though, kangaroo meat contains the highest levels of Conjugated Linoleic Acid (CLA) of any red meat. It is a lean, high quality meat with only 2 percent fat. Also, because it is harvested from the wild, there are no hormones or antibiotics that could harm your pet. The apples are rich in antioxidants and pectin. With Addiction Holistic dog food your pet can get a balanced, nutritious meal without the food allergies or sensitivities. In fact, it has been voted the top dry dog food by the Whole Dog Journal. It is a hugely flavorful food that your pet will love. It is also a responsible food that is good for the environment. 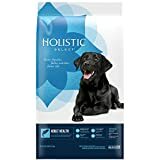 The top listed ingredients of Addiction Holistic dog food are easily recognizable and customers are very satisfied with the results. Feeding your dog a high quality dog food will improve their overall health and longevity, where poor quality food can deplete the immune system over time. If you have a sensitive pet, the last thing you want to do is be insensitive to their needs. Feeding your pet a hypoallergenic dog food is one of the best ways to minimize their symptoms. Just remember, limited ingredients in a dog food does not mean limited nutrition. A hypoallergenic dog food will provide all the proper nutrients your pet needs to thrive. Because they are a little more expensive, many owners hesitate to invest in hypoallergenic brands. What they fail to realize is that with top quality ingredients and no fillers makes up for the limited number of ingredients. You can feed your pet less food and still provide them with more nutrition. In the end, when you invest in a high quality food for your sensitive pet you are actually investing in a happier, healthier and longer life for your dog. Well worth the money, if you are passionate about always providing your dog with the best. No dog food will work for every breed, every life stage, and every health condition. However, if you evaluate your pet and discover the allergens they are most sensitive to, you can make an educated decision on the best hypoallergenic dog food. Take the time to be informed and to choose wisely. If you have any doubts about changing your pet’s diet, you should consult with a vet and get professional help. If you love your pet and consider them to be part of your family, then prove it by feeding them only top quality food designed to prevent their allergies or intolerance. You can meet the nutritional needs of your dog through limited ingredient dog foods. So don’t settle for anything less. Hi! Just wanted to stop by to say hey. I really like your blog and the subject matter. I’ve been a dog person my whole life and I just finally got my first dog, and I’ve been following your rules of proper food for dogs. Otherwise I would have purchased some junk dog food where my dog would probably end up getting sick. Anyways, thanks for having this awesome site, it truly is helpful. I have never had to buy a hypoallergenic formula before, but our newest puppy has some pretty serious stomach issues going on. I have a feeling that he has some food allergies, so we will be switching to a limited ingredient, grain free diet for a while to see if it makes a difference. These all look like great picks! Our dog has pretty serious food allergies, and we have had him on the Nutrience Grain Free formula for a few months now. We have noticed a world of difference. If your pup has stomach sensitivities, it may be due to allergies. Give one of these foods a try, and hopefully you have great results like we did.